Welcome to 2013, the year of the snake. Everyone celebrates the coming of the new year in their own way: party-goers engorge themselves on wine, people with bad habits make resolutions they usually can't keep, and escape game developers like Place of Light create tributes. Soom 2013 is such a game. You know the basics if you're a point-and-click fanatic: click around the room, pick up items, solve puzzles, and ultimately (hopefully) escape. Items that appear in your inventory in the lower left can't be examined or combined, but you can select them by clicking them, then use them once they're marked with the red star. 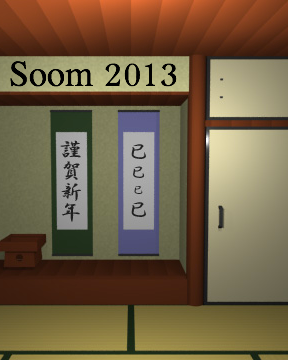 Although Soom 2013 isn't long at all, particularly compared to Place of Light's earlier works like Loom Dawn and Room Marine, it's good while it lasts. The room and its puzzles are very well designed, and although the lack of any sound can be a little disconcerting, it doesn't really get in the way. There's one part that'll absolutely stump anyone who's not familiar with those weird Japanese doodads involving a tangerine-headed snowman on a pedestal (seriously, what are those even for? ), but the rest of the puzzles are so well done that that's easily overlooked. As someone born in the year of the snake myself (...er, not this year of the snake, the one 24 years ago), I consider myself qualified to recommend Soom 2013, and I do so eagerly. Soom 2013 Walkthrough now available! You'll start facing two scrolls. Note the purple scroll; it contains the same symbol four times, at different sizes: large, medium, small, large. Record that. Also note the pedestal to the left of the scrolls; you can zoom in on it. There's nothing you can do with it yet, but note what's written to the right: white-white-white-white-white = 1. Zoom out. The door to the right is locked, and the cabinet above is missing a handle. While zoomed in on the door, you'll see another code: white-black-black-white-white = 3. Nothing more to do here, so back off and turn right. Some shelves and a calendar. 12/31? Not anymore, so tear off the page to make it 1/1. There's another code: b-w-b-w-b = 5. Zoom in on the second shelf from the bottom: it requires a weird combination involving letters. You don't have it, so zoom out again. Now check the bottom cabinet. It requires a code we DO have. Clicking the squares resizes them; make them large-medium-small-large like the purple scroll, then open the cabinet. Inside the cabinet is a handle (take it) and another code (w-w-w-b-b = 2). Zoom out. Last, let's check the vase. We can't do anything with it... wait a minute! Look to the upper left corner of the screen while inspecting the vase and you'll see an opening you couldn't before. Click it to see... a doll you can't do anything with. Huh. Zoom out all the way and make another right turn. The door's locked, but zooming in on it gets you another code: w-b-w-b-w = 5. I thought b-w-b-w-b was 5? Weird. Upon zooming out again, take one of the oranges from the bowl. You'll use it later. Then, turn right. Take the remote from the table. It needs a five-digit code, and you don't have one. Click outside the remote to put it back. Try both sides of the window. On the left is a jumble of eight letters; on the right is "Happy new year". Say... how many of the letters in the left are also in the right? All of them! But there are some extras: a Y, an R, a P, and a W. Remember those four letters; we've already seen where they go, but we'll get to them later. Turn right one more time to get back to where we started. Put the handle in the cabinet above the door, then open it and take the snowman. You'll also find a piece of paper inside. So THAT'S the logic behind those weird five-square strips we've been seeing everywhere! Each number is the number of identically colored groups of squares in the strip. For instance, black-white-black-black-black is 3 (black, white, black-black-black). On to business. Check that pedestal to the left of the scrolls again. Stick the snowman on it, and the orange on the snowman. Take the green ball that appears. Back off and turn right again. It's time to tackle that box with the eight letters. Click the R, P, Y, and W to shade them, leaving the others light, and then click the center. The box should open, providing you with a key. The key goes to the door that's now to your right. Don't get excited, you're not out yet... but you do get two useful clues. One is a sequence of light and dark squares, and the other is something about a round thing in the hand of one of those dolls or some nonsense like that. We haven't seen a doll in that pose yet, though. Remember, count the groups of same-colored squares. Look at each column separately and get its number: 3, 2, 5, 1, 4. Go try that code on the remote on the table. Enter it and press the button to turn the air conditioner on, then put the remote down and take the gold object from the air conditioner. A horn?! It can't be large considering where it was. Hey, that doll in the secret shelf compartment was in the right pose to be playing the horn, wasn't it? You don't have to zoom in on the vase to see the compartment. Just click to the right of the second shelf from the top, the one that doesn't have a compartment visible from your position. Once there, put the horn in the doll's hands. Zoom out and... WHOA! That doll's quite the charmer, it seems. Zoom in on the vase and take the key from the snake's mouth. The key goes to the door beside the scrolls. Inside is a rather MASSIVE cone-hatted doll in a familiar pose. Give it the ball and it'll give you a screwdriver. Remember the panel behind that other door? It was held on by screws. Unscrew it and remove it to reveal a puzzle. You need to color in some of the squares so the numbers are correct. Remember, each number is the number of groups of consecutive colored squares. The red square in the lower right is locked, so start there. Click a square to switch it between black and red. Tip: rows or columns with EVEN numbers begin and end with DIFFERENT colors, while those with ODD numbers begin and end with the SAME color. For instance, the bottom row's number is 3 and at one end is the locked red square, so the other end must also be red. The solution isn't unique, but as long as the numbers are correct it'll work. Here's a solution that'll work: black-red-red-black-red / red-red-black-black-black / black-black-red-red-red / black-black-black-black-black / red-red-red-black-red. Once you've got it, click the locked red square. YEEEEES! The door's open! Go out and get some fresh air! can't wait for the walkthrough to this one. it's been 2 years since a place of light game has arrived on this site. Ugh. I know my brain is not working yet, but I'm just staring at the screen without a clue what to do here. I think my brain sees Japanese only and immediately shuts down. I could drop some hints, though. The ones seen around the room don't really mean much. They are just examples. Look for the number of distinct segments. i.e. if the whole strip is dark (or light) there is only one group. If it goes dark then four light, or two dark then three light, etc. there are two groups. What about "Happy new year" lock? Zoom in on the bottom cabinet and play around with the buttons. Notice how they change sizes? Set the sizes to match the sizes of the symbols on the scroll. Open door and take handle. Turn back and use it on the upper cubby. Turn to look at the window screens. Slide them back and forth a few times. Notice any difference between the two? Which letters are missing on the left? look at the two panels and compare them. notice anything different? I have to run, but you should have more than enough to get you going now. There isn't a whole lot more to do. In other words, make each row and column contain the correct number of segments and then push the starting button (lower right) to exit. 4red, you've got one letter too many on the left side - that's the one you're missing. I was missing it, as well. There's a note (that won't go in inventory) that will help a lot, halfway through. I have two items, and I can't find anywhere to put them, anything to do with them, and no puzzles left to do� OH. Yes, that was pixel-hunting. Rather mean pixel-hunting. I'm torn as to whether that was cool or really unfair. The Happy new year puzzle still eludes me, none of the help above is actually helping. I see the difference in available letters, but still dont' know the answer. Curious, if there is only one ending? Fun little game. The note confused me. But once I saw 2 variations for number 2, it clicked for me . letters missing on the left side. I am at the end, but after filling in the 5x5 board, nothing is happening. I tried both my solution and SonicLover's, which is almost the same as mine. Which door is supposed to open? I suppose it's the one beside the door with the 5x5 puzzle, but it's staying closed. I still have the screwdriver. Am I supposed to do something else with it? The 5x5 puzzle is fun, and new for me. I found it difficult to solve with only two states though, so I pasted it into Paint where I could work with three states (black, red, dont-know). You need to confirm your solution by clicking the locked red square. It's unintuitive, I know. Oops, I see that instruction is right there in your walkthrough. Thanks SonicLover! I can't figure out the panel behind the one with the screws. Yes I know how to figure it out. Doesn't make sense, though. Start by figuring out the one, and then the fives, and then the rest of them. That's how I figured it out, anyway. Hope that helped. so I tried the negative version and it did !